Ayurveda assessments series give you the ancient Ayurveda wisdom to know who you are, what you need to stay healthy and what diseases or conditions you are pre-disposed to. Weather you are looking for an individualized life plan, have a condition or illness you would like help with, needing a cleanse protocol designed for you or wanting Panchakarma, the Ayurveda assessment series is for you. There are three doshas in Ayurveda—vata, pitta, and kapha. You have a unique combination of these three doshas that stays constant throughout your life and serves as a blueprint for your health. Learning your unique doshic combination and understanding your constitution can reveal your natural inherent strengths, and illuminate your greatest challenges. This one hour health/dosha assessment will give you a complete analysis of your personal constitution, including a deeper understanding of how it affects everything in your life, from physiology and digestion to body structure and personality. Erica will teach you how you can take charge and master your own health in simple and very effective ways. You will also be equipped with herbal, diet, and lifestyle guidance to help keep your doshas balanced. A Cleanse assessment or Panchakarma Assessment is used to design a unique plan for your cleanse or Panchakarma. What to integrate Ayurveda into your life. Erica offers a 6 month or year long package. ​everyone can get health from their books or programs. ​are as unique to you as the foods you consume. Ayurveda treatments are unique to the practice of Ayurveda. or help with a chronic condition, Ayurveda has a treatment for you. the three bodily doshas by a number of therapies. Home treatments are an important part of Ayurveda life. ​or how to use the correct food treatment. ​left by disease and poor nutrition. 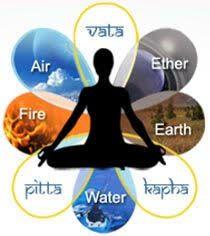 Vata derives from the elements of air and space. Pitta devrives fro the elements of fire and water. ​moist nature of Kapha makes food choices important to decrease congestion, cholesterol and weight. Ayurveda cooking is a practice, much like yoga. As such it is not something you do for a few weeks but it is a cooking style that creates a vibrant, healthy and self-healing you. This style of cooking inspires an integration of stewardship towards your body. ​the benefits of this Ayurvedic cooking class. and without it a person will die within just a few days. needs water in order to function properly. "I had been looking on the internet about Ayurveda and I was more confused than ever. I decided to visit Erica at Okanagan Ayurveda. I was happy that I did. Erica made Ayurveda very approachable and started my on a lifestyle plan suited to me. ​I suggest you go and see Erica." "come back to who they truly are". ​we can begin to build a healthy world. Erica’s passion for yoga and Ayurveda began 20 years ago. Desiring a deeper and more subtle understanding of the human experience led her to yoga teacher training and a yoga therapy certification at Mount Royal University (2009). There she met and studied with Nischala Joy Devi who offered her unique feminine perspective of the Yoga Sutras. Nischala Joy Devi is a master teacher and healer and monastic disciple of Sri Swami Satchidananda. She studied with Susi Hatley and her functional synergy “ approach to anatomy and asana and Robin Rothenberg and her energetic models for using asana and pranayama for healing. While studying at Mount Royal, Erica was certified as a Thrive instructor. The Thrive program was designed specifically for cancer patients at the University of Calgary. At Mount royal she had her first formal Ayurveda class which took her on another journey to initial study with Matthew Remski and Todd Caldecott until she found her true home in traditional Kerala Ayurveda. At Kerala Academy it was an honor to learn traditional Ayurveda from Dr. Jayarajan Kodikannath and Dr. Suhas Kshirsagar and accomplishing an Ayurveda Practitioners certification. Along the way, she interned in an Ayurveda hospital in India and took courses in Panchakarma and Ayurveda body work. While in India she had the opportunity to intern at Ayuervedagram, a private clinic outside of Bangalore, India. My training continued with Ayurveda formulation and bodywork certification at CCa and the study of Yoga Nidra and mindfulness-centered somatic psychotherapy. I volunteer with the baby program at the food bank. I am also going to start my doctoral program in Ayurveda Medicine this spring! I am so excited. Give the gift of healthy living.